PLACENCIA, Stann Creek, Wed. Feb. 17, 2016–Dominica national, Ambassador Irwin LaRocque, will serve a second term as Secretary-General of the CARICOM Secretariat. CARICOM Chairman, Hon. Dean Barrow, Prime Minister of Belize, told the media when he made the announcement this afternoon that the vote to have LaRocque reappointed was unanimous. “I am as convinced as anyone else, and perhaps more so, that the Secretary-General has done an exemplary job… his commitment to reform, the changes he has already made along the lines of obliging the Secretariat and the Community to become more productive, more efficacious, are well known; and he’s done all this while remaining throughout extremely even-tempered [and] accessible—any head can get him at any time, including very early in the morning,” Barrow said. Barrow noted that although LaRocque’s current appointment ends in August, they wanted to address the matter of his reappointment now, since the next opportunity to do so would be in July, way too close to the end of his 5-year term. Back in 2011, LaRocque became the 7th Secretary-General of CARICOM, succeeding H.E. Sir Edwin Carrington of Trinidad and Tobago. 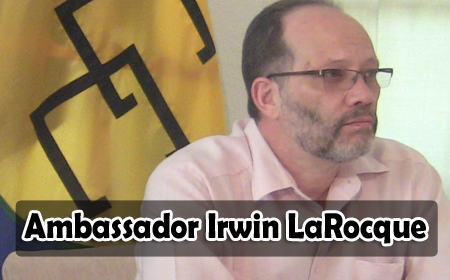 LaRocque had previously served as Assistant Secretary-General for Trade and Economic Integration at the CARICOM Secretariat—a post he had held since 2005.